In nature, the predator-prey dynamics is always wonderful to witness, be it a tiger bringing down a sambar or a gaur, a pack of wild dogs chasing down their prey, on a smaller scale, a jumping spider stealthily stalking its prey, or a snake, snapping up its prey with its lightning fast strike. All these are true adrenaline pumping moments. Moments which get etched in the viewer’s mind and stay on for a long time to come. Though these are daily and routine occurrences in nature, they are not the most commonly seen. So, when one such opportunity comes by, it’s nothing short of exhilarating and exciting. On one of my visits to Agumbe, I was witness to one such event. A short photo story of the same. It was getting to be around 11-ish in the day, pretty warm for a monsoon morning. The snake was lying in full stretch, with its body being very delicately supported at different points by thin twigs of the shrubs. Most of its upper half was hanging down and eyes focused on something amidst the growth on the ground below. It was in this position, when we first saw it. Looking at the way it’s eyes were riveted, we were pretty sure that it had seen something on the ground, may be a frog or a skink. Also, the green vine snake, being diurnal ( active during the day ), there was a high probability that it was looking for a meal. Keeping a safe distance, we settled down to observe. It seemed to be lowering itself down, trying to get closer to the ground. It was doing this in a very subtle and slow manner. It was using the breeze to its advantage. It lay absolutely still when there was no gust and moved only with the wind. We were discussing that this is a strategy used by the green vine snake to avoid detection and not cause any distraction to its potential prey. This, along with its superb camouflage made the snake completely invisible. Having gotten pretty close to the ground, but still hanging down from the shrub, the snake stayed there, in that position, absolutely motionless, for nearly, a couple of hours. We knew that it was about to hunt, but couldn’t assess as to when. So, we went around photographing other subjects nearby, not venturing too far, just in case if something did transpire. After quite a while, Udith, one among the group, called out, saying that the snake had caught something. I rushed to the place to see that it had picked up a little frog from the growth below. It had hunted, indeed !! Was equally amazed at the fact that the tiny frog stayed put for all this time, completely oblivious of the impending danger. The strategy of the snake had worked and how! Hunting is definitely an art and the predators in nature, learn and fine tune the skill over a long period of time. 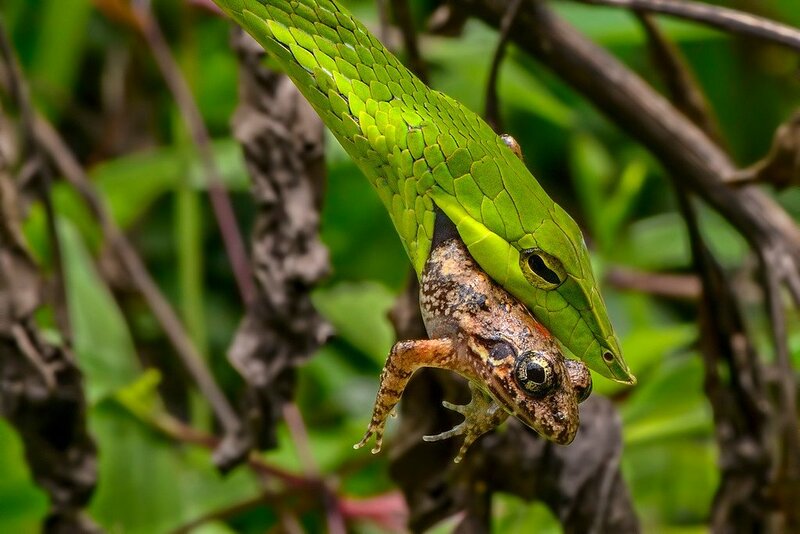 Trying to get a proper grip on the frog, the snake started widening its jaw, stretching the surrounding muscles, the scales on its mouth starting to move away, giving it all the flexibility. It then, slowly began moving its wide open upper and lower jaws, over the body of the frog, sort of like rolling over it, pushing the frog further inside. A low, fading, distress sound coming from the frog, is heard. But it has no escape, these are the last few moments of its life. With the frog down its throat and having finished a quick satisfying meal, the snake clambered up the shrub and settled itself down for a nice little siesta.